sfgirlbybay: Birds of A Feather. Birds of a feather should be flocked together, no? 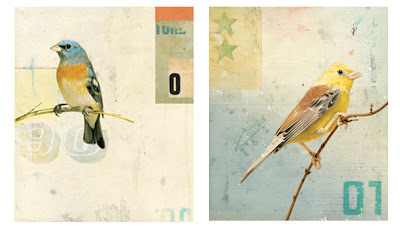 I love these new prints from Kareem Rizk's titled Birds No.1-5. 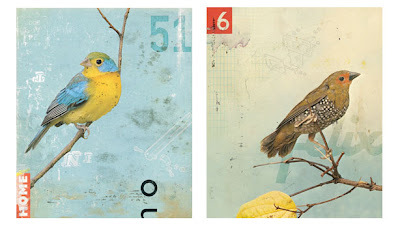 Yes, it's true - Bird No.3 is missing. Apparently, it's a long story. Available at BlueFlip Art, I think all four of these very inexpensive, but very lovely bird prints of Kareem's would look great in a set. The 9.2" x 11" giclee prints are available for $24.95 each. Because they look so nice as a set, entering the coupon code "KAREEM" at checkout takes $20 when purchasing all four. And, if you don't know about BlueFlip yet, a percentage of all sales proceeds go to the artists' favorite charity. Kareem chose the Starlight Children’s Foundation Australia as his charity, which means that 10% of all of his sales will go to help brighten the day seriously sick and injured kids in Australia. I love these. I just posted an inspiration board that I made based on the bottom left one. Take a look if you get a chance! These are great. I am seriously thinking about a purchase here.